Cathy, nice to think we’re growing the same camellia–hope you’ll see plenty of blooms next year at least. My Yuletide has been growing since about 2002 or 2003. It’s over 7 feet tall. Barely able to reach it, I grabbed the branch used in this arrangement and pulled it toward me to cut it. so beautiful………and who doesn’t need more beauty in their lives?! A very artful arrangement. Camellias are opening here too. Thank you. I keep seeing white ones around town that are gorgeous. Tried planting some about 3 years ago but they didn’t make it. Will keep trying. So perfect! I may be a vase crammer but I admit that ‘Yuletide’ shines all on its own. I’d enjoy stuffing some vases with the gorgeous materials from your garden Kris. Thank you. Not so many things blooming here this week as you were able to find. Thanks Cathy, I was in the mood to go upwards! The vase was a gift from a really dear friend who has since passed away. I don’t use it often but it seemed perfect for these branches. This s stunning Susie. I’m so tempted to but Yuletide myself, I know my local nursery has it. Thanks Christina. Do give it a try, somewhere with some moderate amount of water. I’ve planted other camellias without much luck but this one is ubiquitous in our area and has been reliable. My grandmother had one in her front yard that actually was a full tree. Mine is about 7 feet tall after about 15-16 years. All my Camellias (all 3) are in pots as they don’t receive enough water to make buds if they are in the garden. They are on the terrace under the Wisteria throughout the summer, adding green foliage to the area. In autumn I move them to near the back door so I see the flowers every time I go out. That sounds nice–and you enjoy the gentle fragrance as well. Thank you Julie. Yuletide grows easily here, while most of the other camellias I’ve planted haven’t made it. I really would love a white one. Looking at your vase again I can see that the stems are directly in the florist pins but not water. Will you leave it like that? Or change the vase so that the stems sit in water? Ha, you caught me! The floral pin wouldn’t fit into the vase. That happened because I began arranging and was undecided about which vase I wanted to use. For some reason I became determined to use that green one–the color, height and shape seemed to be just right. I moved the arrangement to a low, flat (and water-filled) bowl after taking photos. This is a beautiful colour, I’m not sure I’ve seen one like it. It makes me want to try Camellias though they don’t do well for me. They spend most of the year with yellow leaves. This is one of the first camellias I’d ever grown. I think it’s beginner’s luck that it’s done well here, because most others I’ve planted don’t like my garden at all. I can’t grow camellias here so I never consider them a yuletide flower but they really are, and you have arranged yours so beautifully. Thanks Donna. 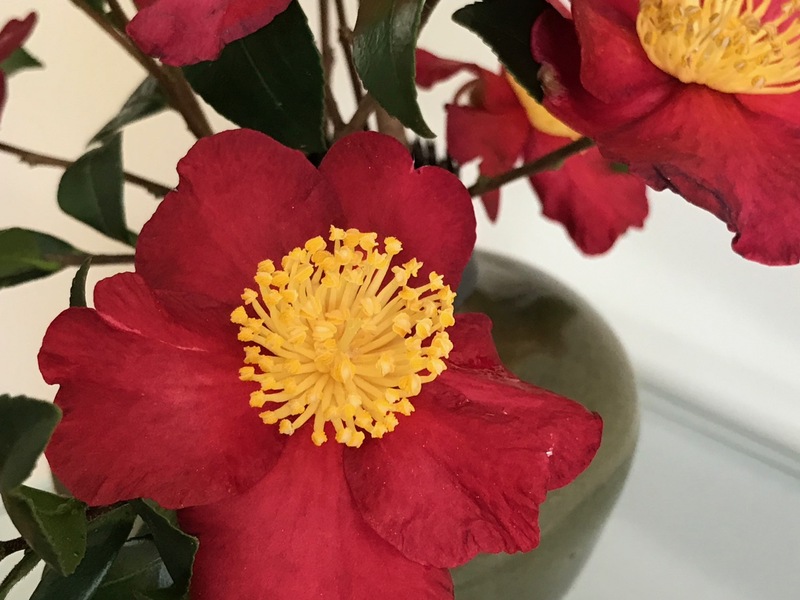 Yuletide is the name of this camellia, but it does indeed brighten up the season here. There are several ‘Yuletide’ sasanqua camellias at work, but none of them are blooming as nicely as yours. A few are hedged, which takes a lot of work to prune. One is espaliered, but it is a bit overgrown. My grandmother’s I recall from childhood was a full-blown tree. The espaliered one sounds lovely, but too much for me to attempt. It takes a long time for them to grow into trees. There are not many like that here just because there are not many old landscapes, and because sasanqua camellias were not as popular here as they were in other regions. Thanks Beth. There was little choice for this week’s vase. Not much blooming here now. 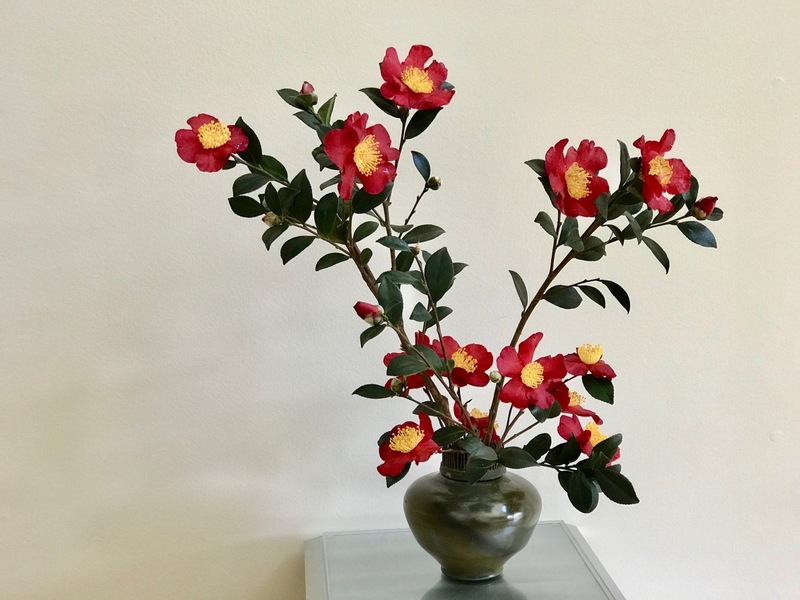 Your camellias are gorgeous and beautifully arranged, as always! Thanks for the amaryllis update. I’m more likely to cut them in the future. Glad you like the camellias, thanks! I think if you cut the amaryllis before the buds are open it should work even better. 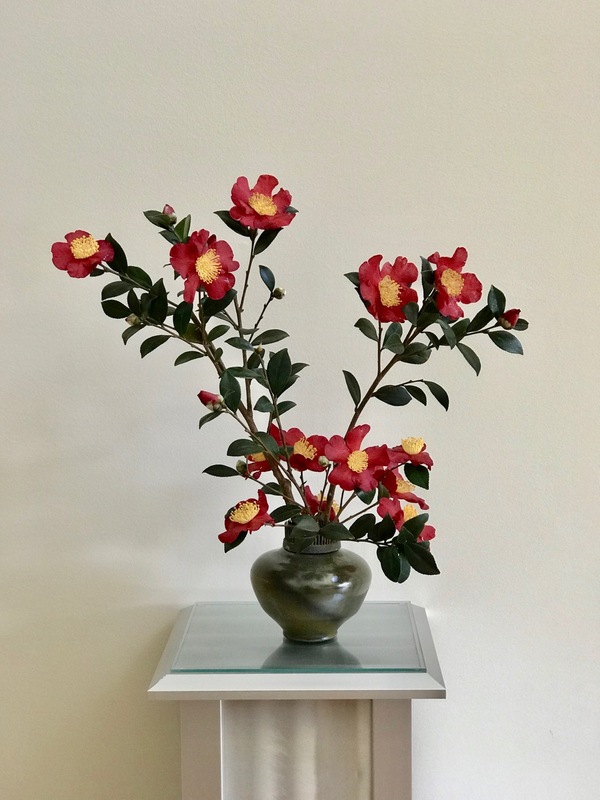 Such a lovely camellia with a perfect bloom time to enjoy for the holiday season. Thanks for the report on the longevity of cut amaryllis, I’ve often wondered. Was happy the amaryllis lasted so well. Those red camelias with the golden centers are beautiful, and so artfully arranged! Gorgeous, every time I see your Yuletide I promise myself one of my own, I love it. Hope you find one that suits! Mine is still blooming despite freezing temps. Snow headed our way tonight.